Wow, it's been a busy day with search engine news with Google announcing news about their mobile phone project: Android and lots of news from IAC pertaining to ASK.com, Yahoo has launched Kickstart, an online social network that connects college students, graduates and alumni professionals on the job market. 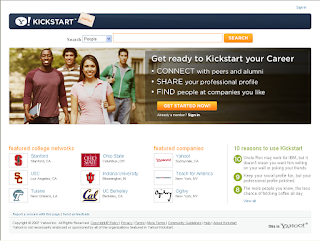 Yahoo Kickstart is a great place for you to contact with alumni and educational institutions that yo may have been a part of during you life. Check it out and look for my profile.